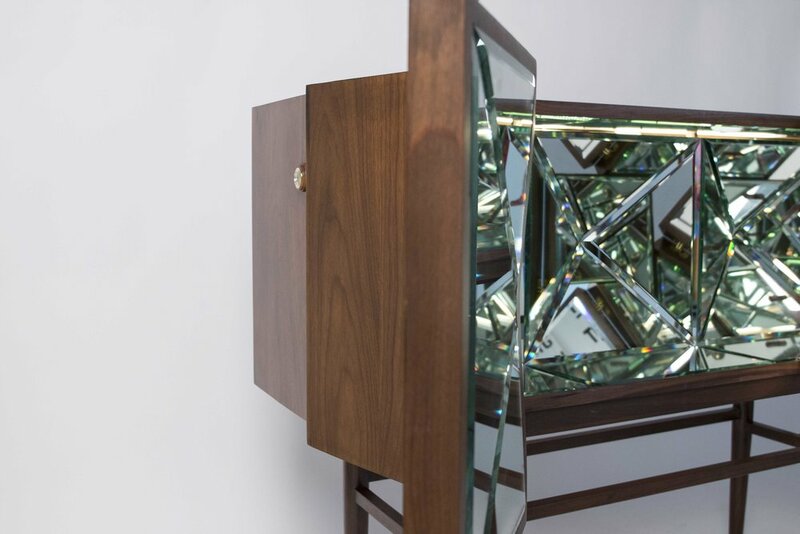 "The space between the void" (The Kaleidoscope Cabinet) is another attempt to deconstruct the paradigm that a cabinet should simply be a box with two doors. The cabinet is part of a series of exercises that includes the Porcupine cabinet and several more deconstructed cabinets that we will be presented in the next months. This particular cabinet was created in memory of an old aunt I had when growing up that always told us we could "look but never touch" the beautiful objects she had in her house. The fact that these objects where out of bound only made them more magical for my brothers and I who where mesmerized in every visit. "The space between the void" offers a reflective cabinet that will multiply what ever is placed inside it, thus painting its interior with the colors and patters of the belongings of its owner. The cabinet includes an interior light and a peep hole so that when its doors are closed and the cabinet is locked. The viewer can still peer inside and see the objects multiplied infinitely like a kaleidoscope offering a glimpse of its precious belongings to those of us allowed to "look but never touch".